Still not clear on how a sports game from a few years ago is connected to our smirking young white friend and Chief Shitting Bull. Asking for a friend. Joker is black? News to me. I guess if Spider-Man can be black anyone can! Right?! If what they were doing isn’t racist in your mind what exactly are you then whining about? And what’s the connection to the OP? Sorry, I don’t really have a point beyond, wondering why people are denying was is obviously true. Those kids are in blackface. What year did that even happen? I have no idea. I am surprised a school administration would allow that, but who knows - maybe it was decades ago. Or maybe blackface is a weird school tradition. Don’t know. Seems insensitive to be in blackface heckling a black opponent though. How is a blackout the same as blackface? How is either term racist? And once again that is false. They are wearing black body and face paint. “Blackface” has a specific meaning and intent which has nothing to do with what was going on here. Who cares what some other kids from some other point in time were doing shill? Wh are people denying the kids who are in blackface are in blackface? Is either flat out racist or racially insensitive. I never said the term “blackface” is racist. How is that relavant to the Covington Catholic High School students, who did nothing wrong? We don’t agree on your version of what you are trying to twist into reality. The only one claiming to be offended here is…you. I never said I was offended. I said the kids who put black makeup on their face are in blackface. Not really that stunning of a statement. Nothing… not sure how you moved to me having a problem with black people… while ignoring a few of you trying to defend the use of blackface at this catholic school. How is that related to the Covington Catholic High School students, who did absolutely nothing wrong? The evil here apparently is that for many years they have had a “blackout day” themed pep rally. It apparently goes back to days long past when scores were kept on blackboards when if you kept your opponent from scoring they were “blacked out”. There’s sure as hell nothing racist about it except to the racially obsessed and reflexive race baiters. Do yo have a source for that? I would like to read up on that tradition. Why don’t you look up the original source of that photo and get back with us. 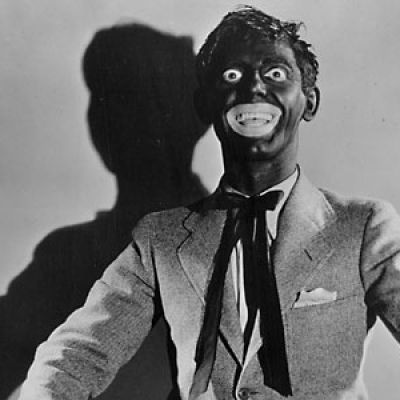 The actor pictured is doing “blackface comedy” which was racist to the core. Now try making an honest and logical argument for a change. Would you mind sharing the link for that second image? It’s really interesting. Then what is this kid doing? Acting?